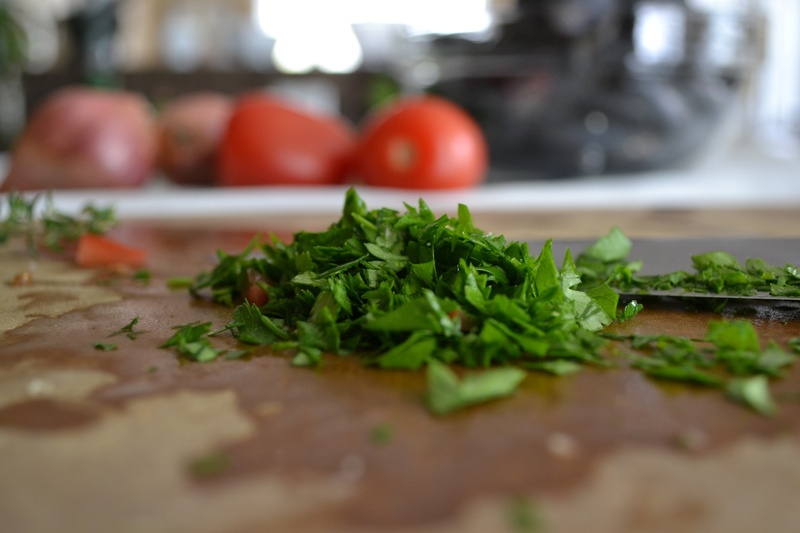 I typically advocate a jump right-in approach to cooking. After all, more often than not, it’s a lack of confidence on the part of the cook that gets them in trouble. 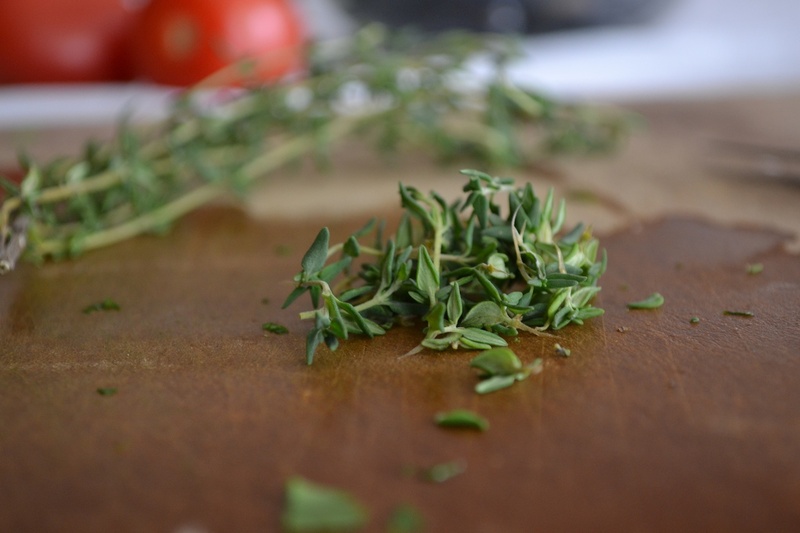 The nervous back and forth between the dish on the stove, rapidly charring before them in a most undesirable way, to the recipe, where they search for answers. 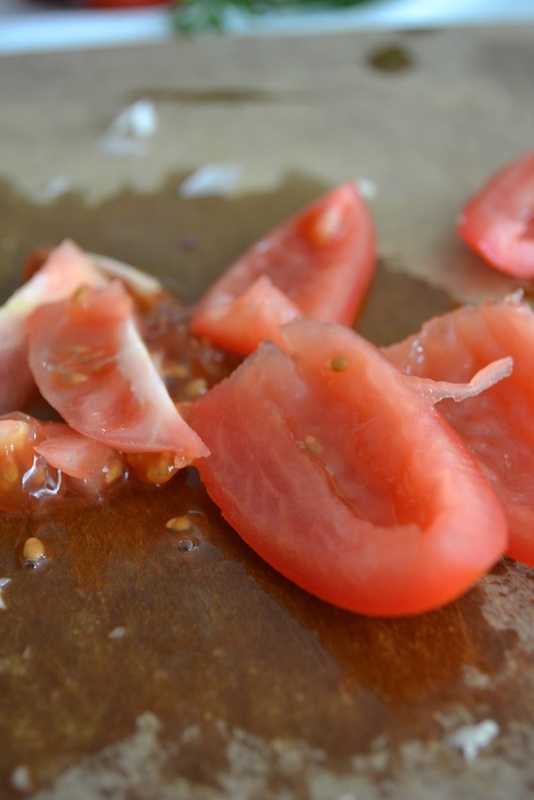 When should I remove it from the skillet? Is this golden brown? Has it been exactly 3 minutes? Is it normal for it to be smoking this much? Most people would benefit from relying on their own instincts a bit more. 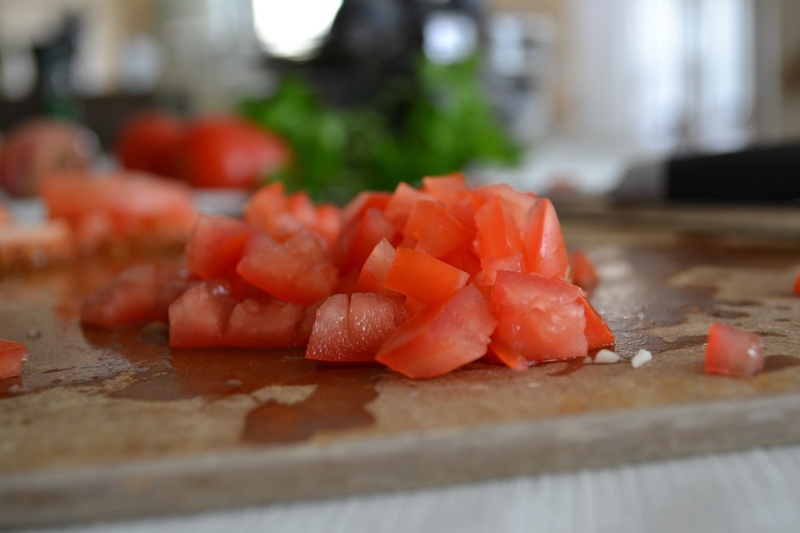 Despite our personal cooking skills, most of us know what burnt looks like and most problems in the kitchen are easily solved with a little commonsense. 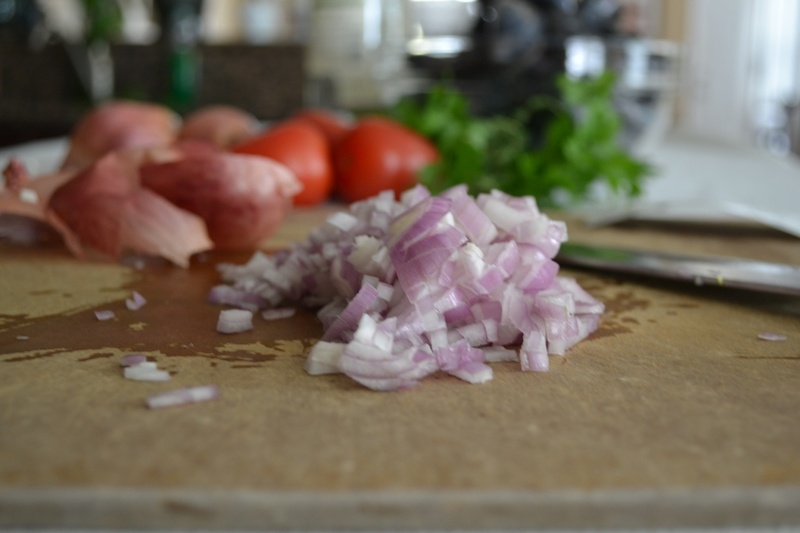 With that being said, there are some things that need a bit of prior knowledge on the part of the cook in order to be approached with confidence. Mussels are one of these things. Monterey Bay Aquarium Seafood Watch lists farmed mussels as a best choice for sustainable seafood. Extremely popular in Europe, here in the United States mussels are found on restaurant menus and rarely on your home table. That is a shame. 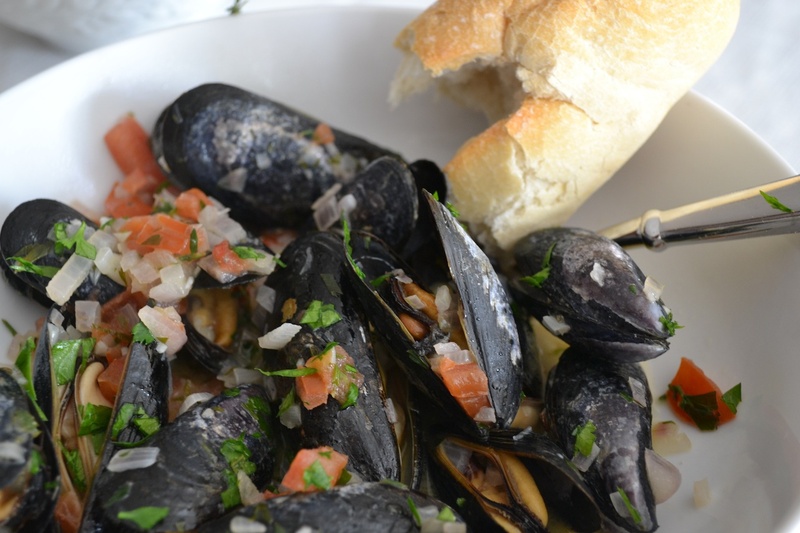 Mussels cost about $6.00 for a 2 lb bag making them an economical seafood choice and that they cook in minutes makes them a perfect candidate for a quick meal. So why aren’t they popping up on more tables? Intimidation on the part of the cook. When it comes to purchasing mussels, we get nervous. That’s where it comes back to your instincts. When I buy mussels at the grocery store, the first thing I do is smell them. If the seafood department won’t let you do that you should be shopping elsewhere. Mussels should smell like the sea. If they smell foul or off-putting, you don’t want them. Mussels are alive when you purchase them and an off odor indicates that many of them have died making them unsafe to eat. The smell test is the first and most important test when purchasing mussels. If the mussels don’t pass, ask to smell another bag or choose another dinner. If they pass the smell test, your next step is to exam the shellfish tag. All shellfish sold in stores have a shellfish tag. 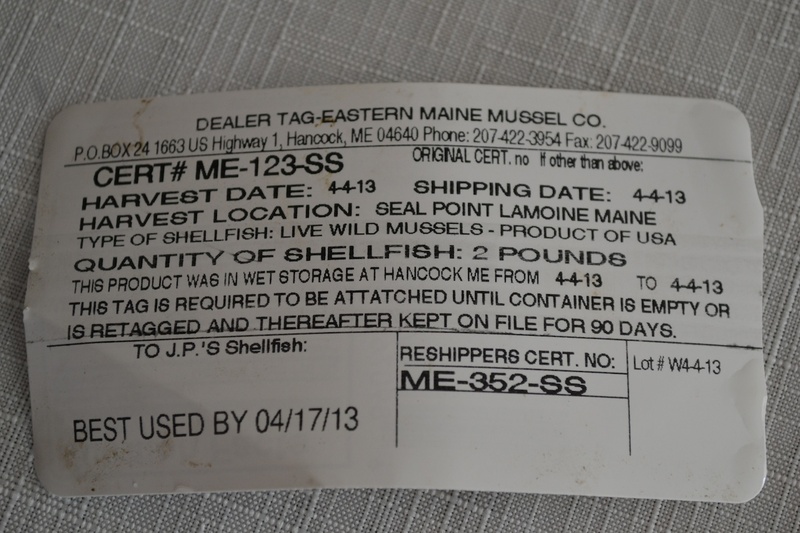 This tag tells you when and where the shellfish were harvested as well as the shipping date. Restaurants are required to keep this tag on hand for 6 months in the event of a food borne illness outbreak. The tag typically has a “use by date”, but I put more weight on the smell test and then, as an extra caution, prefer to purchase shellfish harvested no more than 8 to 10 days before I buy them. If mussels pass the smell and tag tests, then you are good to go. Sold in mesh bags, most grocery stores will place the mussels in a plastic bag so that you can transport them home without them dripping in your car. This is convenient, but make sure the top of the plastic bag remains open. Mussels are alive and when you twist the top of the bag closed, cutting off their oxygen supply, you kill them. For those that make this mistake, you’ll only do it once, as the smell when the bag is finally opened leaves a pungent memory. Once home, fill a large bowl with crushed ice. 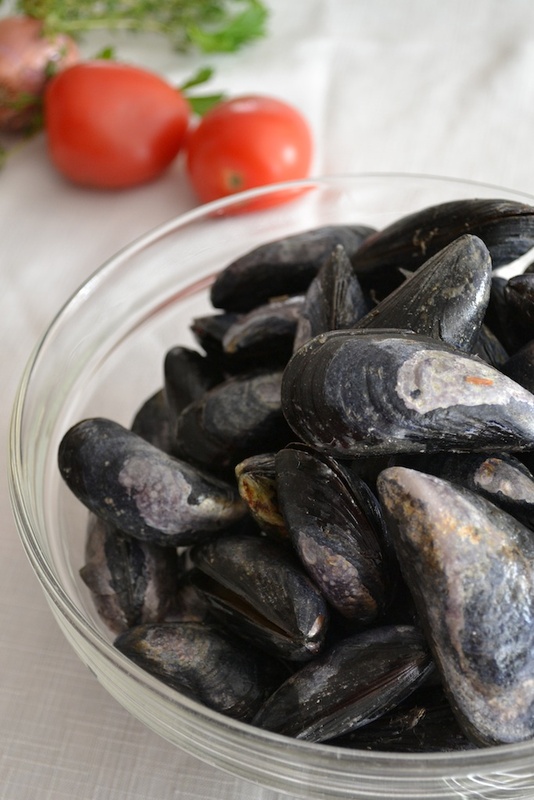 Remove the mussels from the plastic bag and set them atop the crushed ice and place them in your refrigerator. I like to dampen a paper towel and drape this over the mussels as the air in your refrigerator is very dry and tends to dry out the mussels over several hours. Mussels are best cooked the day you buy them although properly stored they can last another day, possibly two. When ready to steam the mussels, the first step is to check them and remove any that might have died. It’s natural to have to throw out mussels so don’t be alarmed if you end up with a few that don’t pass inspection. It’s better to be safe than sorry. 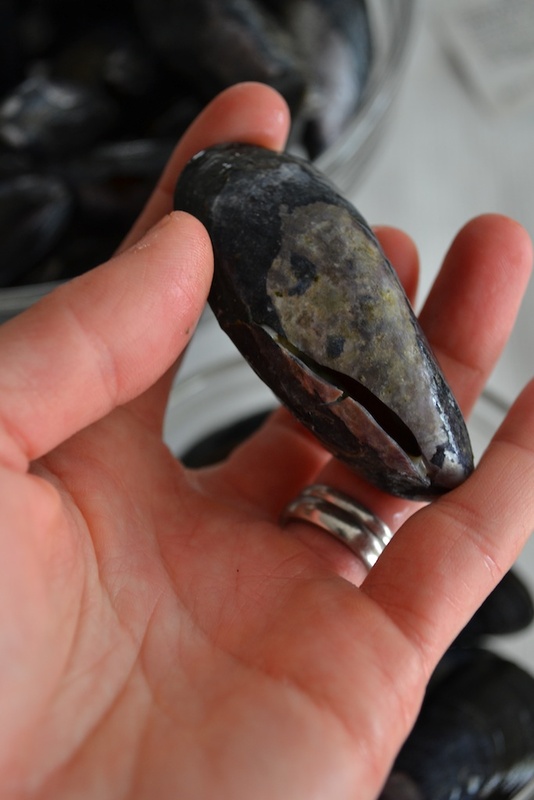 Discard mussels that don’t close when tapped orthat have chipped or cracked shells (see photos below). 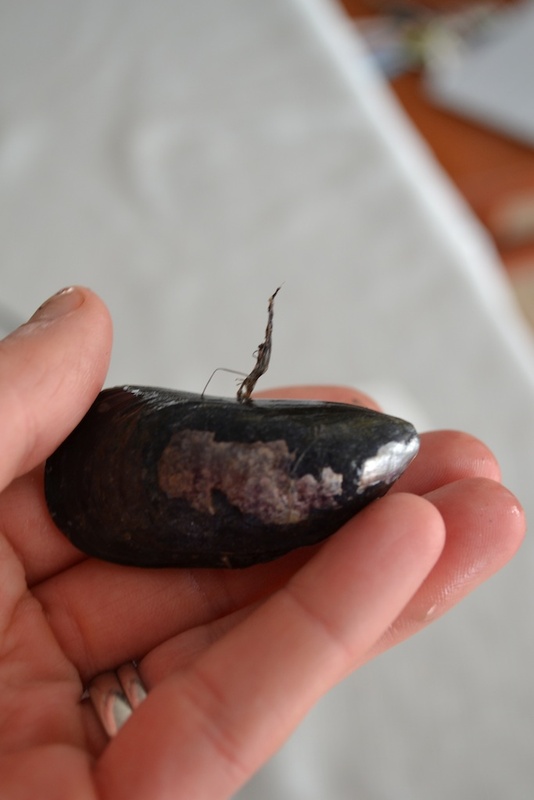 Mussels attach to rocks or ropes with a thread-like piece called “the beard” found on the flat side of the shell (see pictures below). 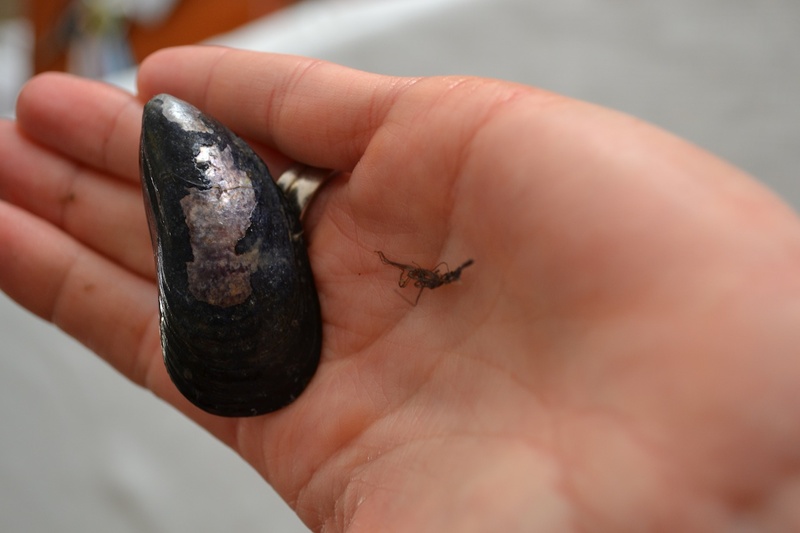 While not all mussels will have a beard, you check for it by rubbing a fingernail down the flat side of the shell. If you find a beard, remove it by grabbing it with your fingers and pulling it towards the hinged part of the shell until it comes off. Discard the beard. 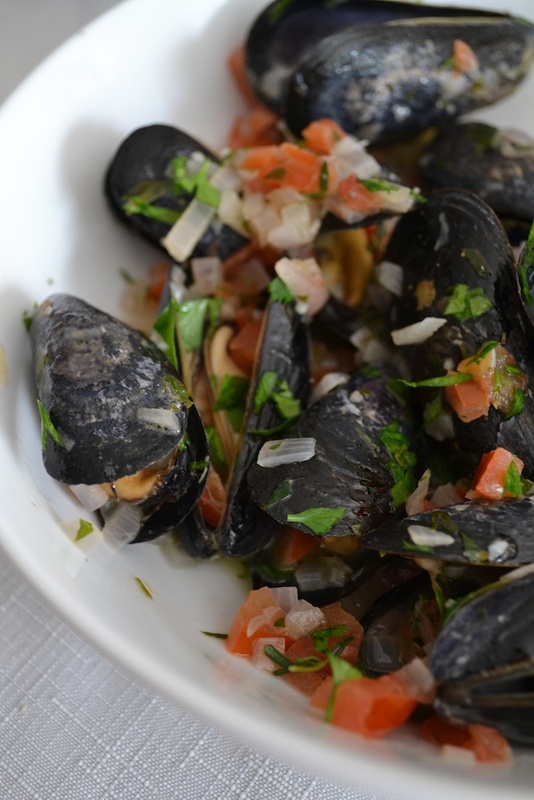 Older recipes may instruct you to put the mussels in cold water with a bit of flour to allow them to purge any sand. Nowadays, purging often happens before shipping and farmed mussels grow in a way that keeps grit to a minimum. For this reason, you can skip this step although I always run mussels under a bit of cold water to wash off any grime. I also like to scrape off tiny barnacles using a fingernail to prevent bits of the barnacle from chipping off into my dish. The easiest way to prepare mussels is by steaming them in a flavorful liquid. 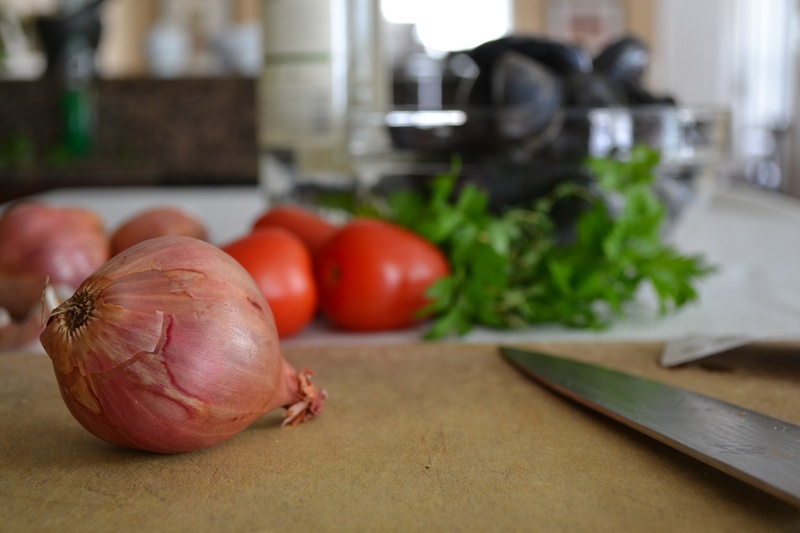 I love the combination of shallots, garlic, tomatoes, and white wine below, but feel free to mix it up. Thai-inspired green curry mussels with coconut milk is another of my favorites. Once the broth comes to a boil, add the mussels to the pot and cover. Shake occasionally (although not too aggressively as shells can chip) and cook for 3 to 5 minutes until the shells open. After cooking, as one final check, discard any mussels that fail to open. And that’s it. The only other thing you need for dinner is a baguette of good crusty French bread. Mussels are good, but it’s the broth left in the bottom of the bowl dabbled up with chunks of bread that will really make you swoon. Happy cooking! Visual learner? 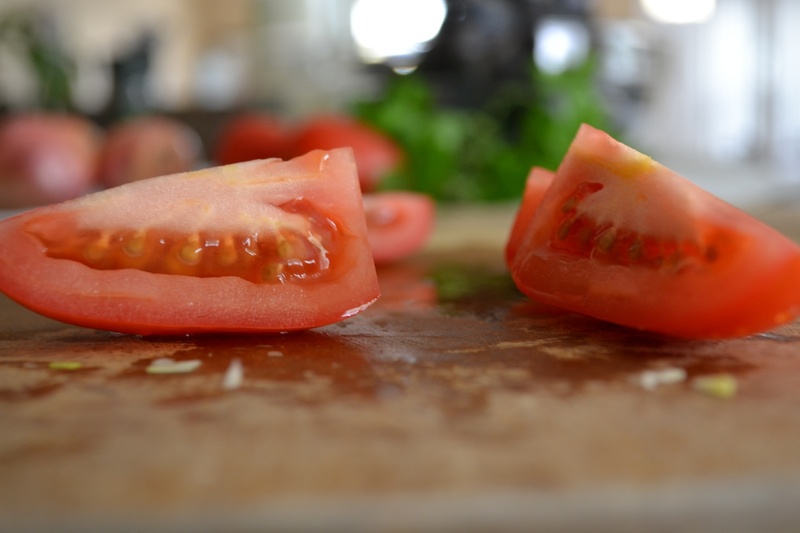 Last week, I prepared this recipe on WCNC’s Charlotte Today show. Check out the clip by clicking here. In a large pot, melt the butter over medium-high heat. 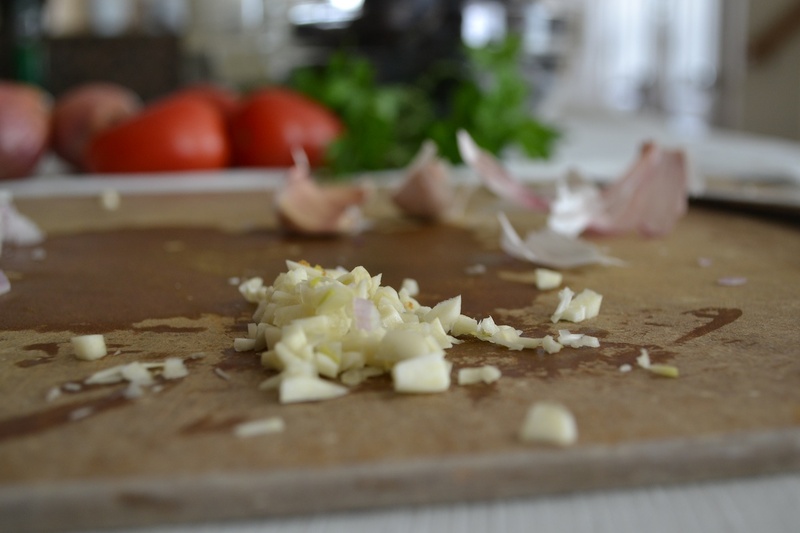 Add the shallots to the butter and cook, stirring constantly, until the shallots are soft about 4 minutes. 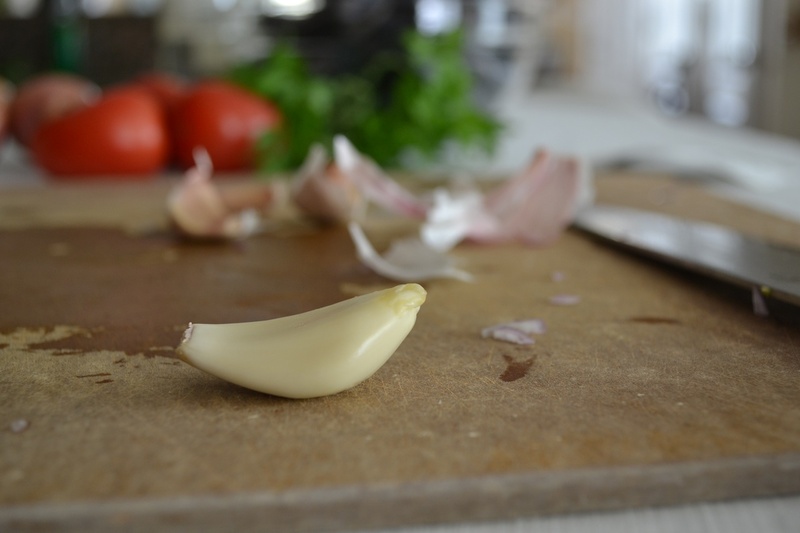 Add the garlic and cook for another 2 minutes. 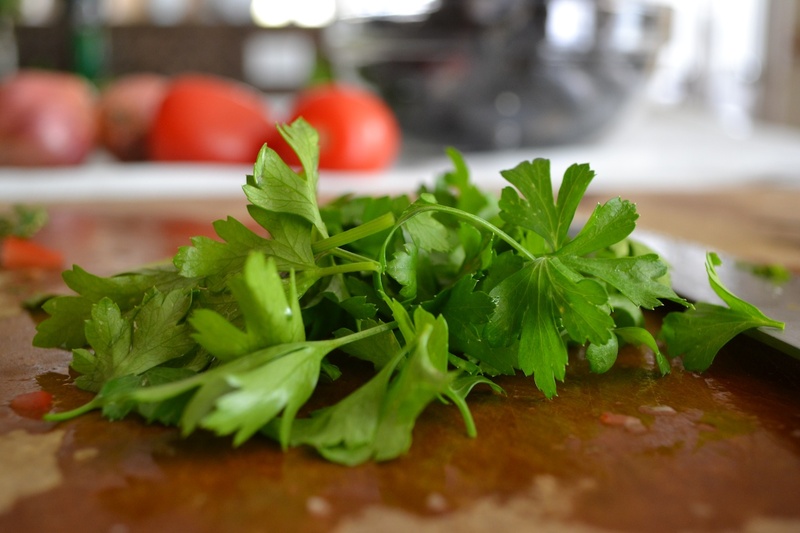 Add the white wine, tomatoes, 2 tablespoons parsley and thyme to the pot and bring the mixture to a boil. Add the mussels and cover the pot. Steam the mussels for 3-6 minutes, shaking the pot gently every 2 to 3 minutes until the shells have opened. Use tongs to transfer the opened mussels to a large bowl. Any mussels that do not open should be discarded. Pour the broth over the mussels and sprinkle with the remaining parsley. 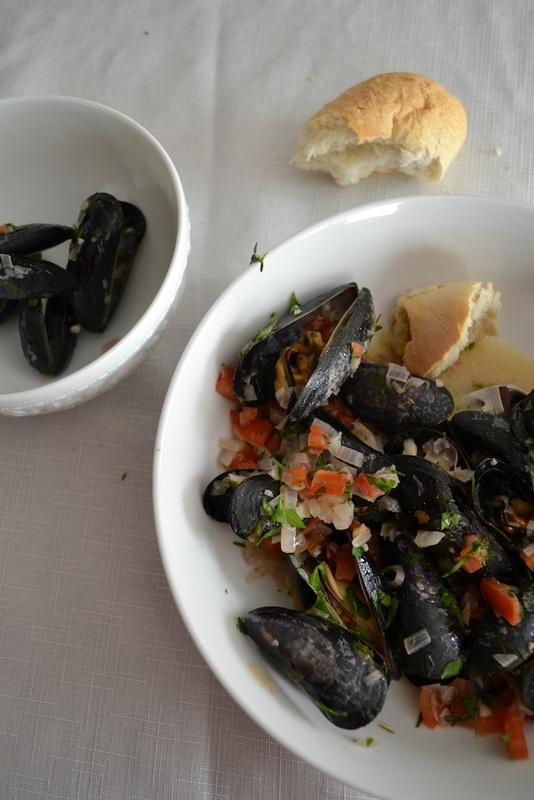 Serve the mussels immediately in their broth with plenty of bread to sop up the juices. 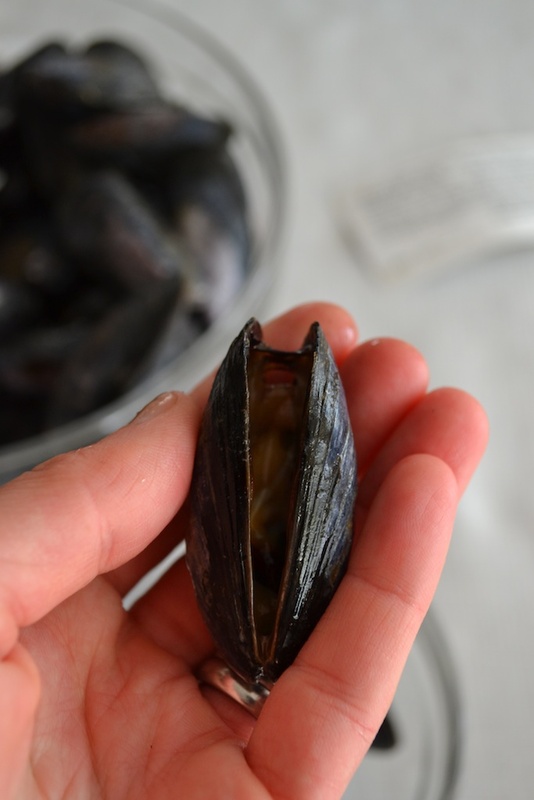 When buying fresh mussels, look for mussels that are either tightly closed or that close when you gently tap their shell. Discard mussels with chipped or damaged shells. Fresh mussels should be kept in an opened container (to allow them to breathe) on ice for no more than a day or two in the refrigerator. The shells of mussels should be scrubbed thoroughly and any barnacles should be removed with a small knife or your fingernail. If necessary, remove the beard (a threadlike piece that is often found around the edge of the mussels’ shell). Remove the beard by grabbing it with your fingers and pulling it towards the hinged part of the shell until it comes off. Discard the beard. This is one of my favorite meals!